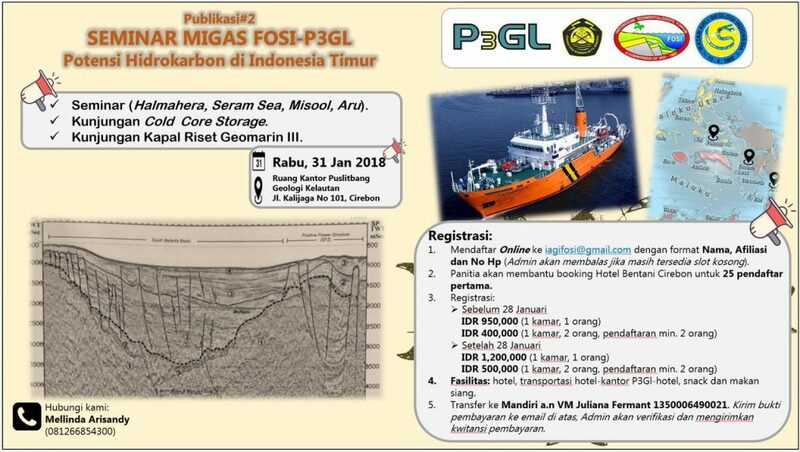 FOSI (Indonesian Sedimentologist Forum) are organizing a geological fun-trip to Kepulauan Seribu, offshore northern Jakarta (Java Sea) on the 5ft-7th of April 2019. 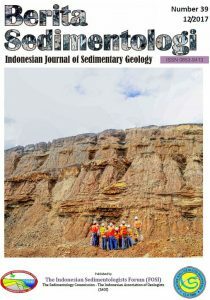 This event is supported by the Geological Society of Malaysia (https://gsm.org.my/) and Sekolah Bumi, Indonesia. 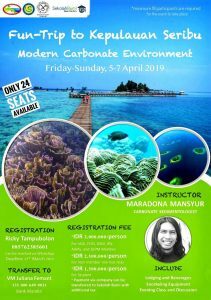 The trip will combine classroom lecture, outcrop visit and snorkeling to see modern carbonate environment in the region. The trip leader and instructor is Maradona Mansyur, an experienced Carbonate Sedimentologist. Maradona Mansyur received his Sarjana Teknik degree from Institute of Technology, Bandung and M.Sc from Chulalongkorn University, Bangkok, Thailand. His main research interests are sedimentology, sequence stratigraphy and carbonate sedimentology. Registration is now open and the deadline is March 23rd, 2019. There are only 24 seats available for this fun-trip so, book your seat as soon as possible by contacting Ricky Tampubolon (contact number at +62-857-6238-5601). Ricky can also be reached via whatsapp. 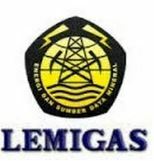 1) IDR 2,000,000/person for IAGI, FOSI, GSM, IPA, AAPG, IAS and SEPM members. Company payment can be transferred to Sekolah Bumi, additional tax will applied, please contact Ricky for further information. – How did channel systems survive high sea level periods? 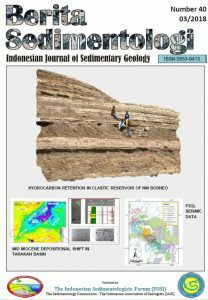 New sedimentological insights from outcrop, modern analogue and subsurface data in the Lower Kutai Basi, E. Kalimantan – by Erlangga Septama et al. 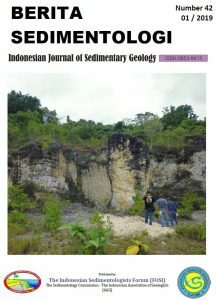 – Reservoir potential of Neogene rocks in the Biak Island and its surrounding areas – by Alviyanda et al. The next volume will be published in April 2019, if you’re interested to contribute, please contact one of our editors. Berita Sedimentologi No. 41 is now published and available online. Pleas download this publication by clicking the cover image above. Otherwise, please click the following link. We hope this publication will be useful to you all. 3rd F OSI Regional Seminar titled “Past & Present Sedimentation in Tropical Region” will be held in Yogyakarta from 5 to 6 September 2018. This is a join seminar with IAS (International Association of Sedimentologists) and SEPM (Society of Sedimentary Geology). The seminar is hosted by Universias Gajah Mada. The committee has the privilege to host speakers Malaysia, Brunei, Taiwan, Thailand, Indonesia, Australia, USA, UK, and the Netherlands. Please fill In the online registration form in bit.ly/FOSIREG or download the PDF FORM here. The registration fee include 2 days meal and refreshers and exclude hotel / accommodation. Registration will be closed 2 weeks before the field trip start. Please note that due to file size limitation from our server, the complete file of BS No. 40 is temporarily hosted at an external website. 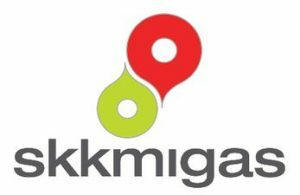 The next edition of Berita Sedimentologi is going to be published in June 2018. Manuscript contributions are welcome. Please contact one of the editors for further information if necessary. 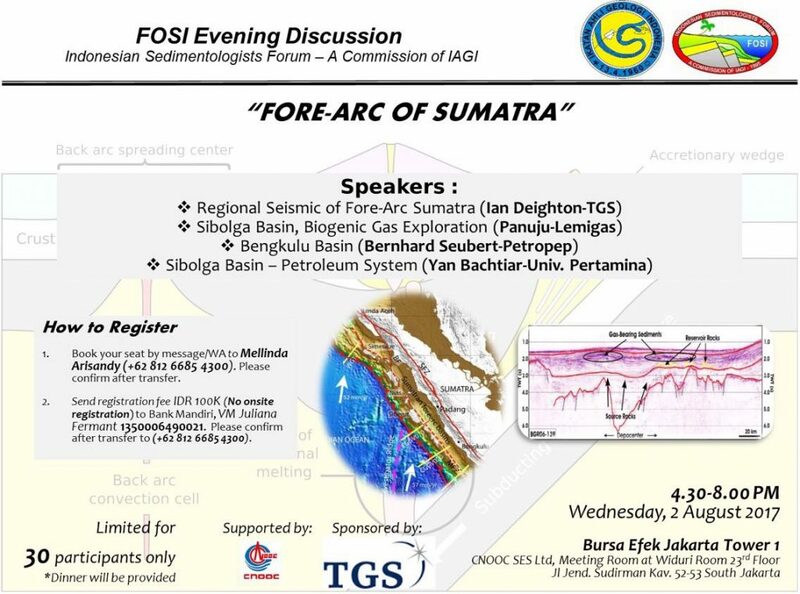 The Indonesian Sedimentologists Forum (FOSI) together with the International Association of Sedimetologists (IAS) and the Society of Sedimentary Geology (SEPM) are going to organize a regional seminar in Yogyakarta, Central Java, Indonesia, from 5 to 6 September 2018. The seminar is titled “Past and Present Sedimentation in Tropical Region”. Pre and post seminar field trip will be arranged. The committee is inviting potential speakers to participate in both oral and poster sessions. 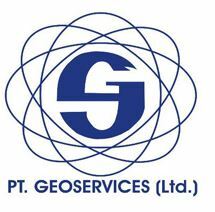 The Research and Development Centre of Indonesian Maritime Geology (P3GL: Pusat Penelitian dan Pengembangan Geologi Kelautan) is an institution which operate research vessels and collect (sub-)marine samples in Indonesian water. They have significant number of seismic and core data. How much can they support the exploration activities in Indonesia? Let’s participate in the seminar in Cirebon. We will visit their cold core storage, survey boat, and see their survey equipments. 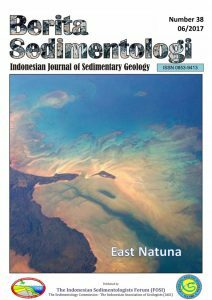 Their experts will also give talks about their recent surveys in Eastern Indonesia. Beware!! Happening soon (31 January 2018), affordable fee BUT limited space. So, please take action,…. register… NOW. 2. Sangatta delta evolution with an updated Miocene paleogeography – by Suandhi et al. The next volume (No. 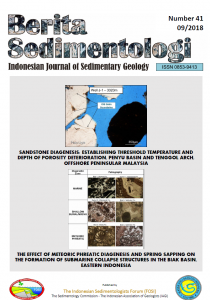 40) will be published in March 2018 and the main theme of this issue is going to be on structural geology and sedimentation. If you are interested to contribute, please contact one of our editors. The next volume is planned to be published in August 2017. We are currently seeking potential contributors for this volume, please contact one of our editors if you’re interested to participate.